The basic ideas developed for the scaling of Posture can be applied to the scaling of gaits across humans of a range of ages. Further, if we assume that the basic properties of muscle are the same for toddlers as for adults, and using a good guess for what these muscle properties are, we find a fairly good quantitive match for details of both walking and running mechanics. Broadly, muscle performs well if it contracts over at least 0.1 seconds. Any briefer than that, and more muscle has to be activated (which is physiologically costly) to produce power than is necessary for the mechanical work. So, while work requirements may be minimised by running with very stiff legs and brief stances, the stances we actually use can be seen as a compromise that is nice for muscle – between minimising work and power. The compromise for running tends to be about 0.2 seconds (giving 0.1 seconds to do the positive work). 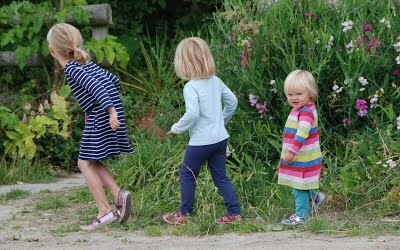 Small children’s short legs waggle backwards and forwards quickly (think of short pendulums), so having a stance period of 0.2 seconds leaves little time for younger children to fly through the air each step. The answer in each case comes down to ‘buying time’ so that the work (despite being greater than absolutely necessary) can be done over a longer duration, and the amount of muscle that has to be activated for the POWER can be reduced.